Why choose HoKeeper Bag Organizer? 1. It makes everything well organized and looks very clean neatly. 4. It keeps your Handbag shape and shipshape. A must have outing essentials for your purse, handbag, tote bag, diaper bag, etc. Approx - 9.85(L) x 5.52(H) x 3.54(W) Inches - Fit LV Speedy 30 and Neverfull PM perfectly. Approx -10.63(L) x 7.88(H) x 5.1(W) Inches - Fit LV Speedy 35 and Neverfull MM perfectly. Approx -13.39(L) x 9.05(H) x 5.9(W) Inches - Fit LV Speedy 40 and Neverfull GM perfectly. Application Travel, School, Casual, Sport, Outdoor, Hiking, Cycling, Hospital, Weekend. 【MULTI-POCKETS】- Three Sizes: Small - 9.85 x 5.52 x 3.54 Inches; Medium - 10.63 x 7.88 x 5.1 Inches; Large - 13.39 x 9.05 x 5.9 Inches. Six Colors: Beige, Pink, Red, Black, Gray and Brown for choose. 10 pockets: 3 exterior pockets, 7 interior pockets. Keep your items orderly and well organized. You can find or see most items at a glance without digging through your bag. 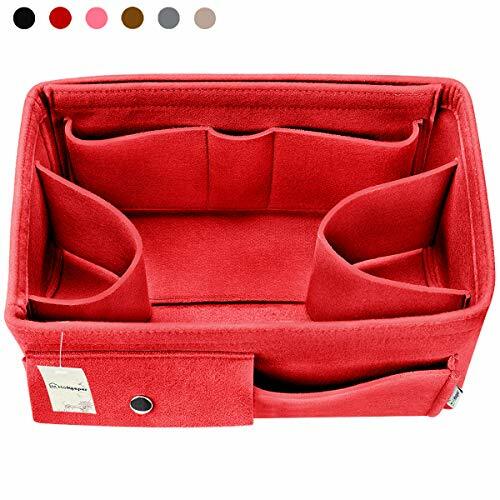 【MULTI-USE BAG】- Could be used as handbag organizer, purse organizer, diaper bag organizer insert, tote bag organizer, pocketbook organizer, base shaper etc. Carry all your stuff neatly & orderly (Wallet, Glasses, Phone, Makeup, Pens, iPad, Notebook and more). Perfect choice for any occasion, such as Travel, Home, Outdoor, Bathroom, Toilets, Hospital, etc. 【LIFETIME WARRANTY】- All Hokeeper bag organizer comes with lifetime warranty. Contact us if anything comes up and we will do our best to get it done in 24 hours. We guarantee 100% satisfaction after-sale service for this item. Please rest assured to buy!